Damn, I had hoped I was farther along in the story than that. This is gonna take awhile. I’ll skip over the part about the trial/surgery. Though, I gotta tell ya, when Tommy was fishing around in that girl’s brain and accidentally brushed against some neuron or something that made her start braying like a gorram donkey in the middle of a federal courtroom…well, let’s just say I chuckled. Heh. Heh heh heh. Ha. Heh. Yeah, kinda like that. You know how it works, what with being all squishy and everything. Needless to say, Wiseau and Shockwave saved the day. They put away the crime lord and saved the brain of their young witness, though she later turned around and sued them for the mental anguish brought about by being embarrassed in a federal courtroom. They took her case and prosecuted themselves and won, though given the obvious difficulty of that statement, they still haven’t figured out which side to find for. Not even in the year 600 Billion. In fact, that’s all there is to do in the year 600 Billion…discuss that single case. These are the hazards of being immortal. 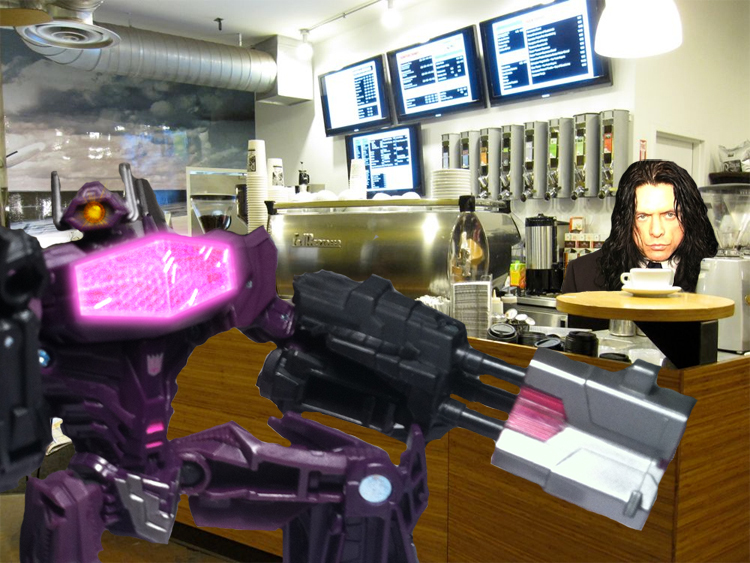 Wiseau and Shockwave swung back by the Roasterie to get a report from the other authorities called to the scene. Turns out that they hadn’t found out much more than what Shockwave had already sussed out, except for the fact that the clones were “immature” and wouldn’t have lived even if they hadn’t been killed. It was baffling, and Tommy said as much. “This is baffling,” said Tommy. “We have 43 headless bodies and no way of determining who they are. Without even that much to go on, there is no way to determine motive and thus no way to find leads, let alone follow-up on them.” Shockwave switched off the computer screen and folded it back into his arm. “Please refrain from making that noise,” Shockwave quickly interrupted. “Fine, whatever! We go to the cloning place now!” Wiseau stormed out of the cafe abruptly. 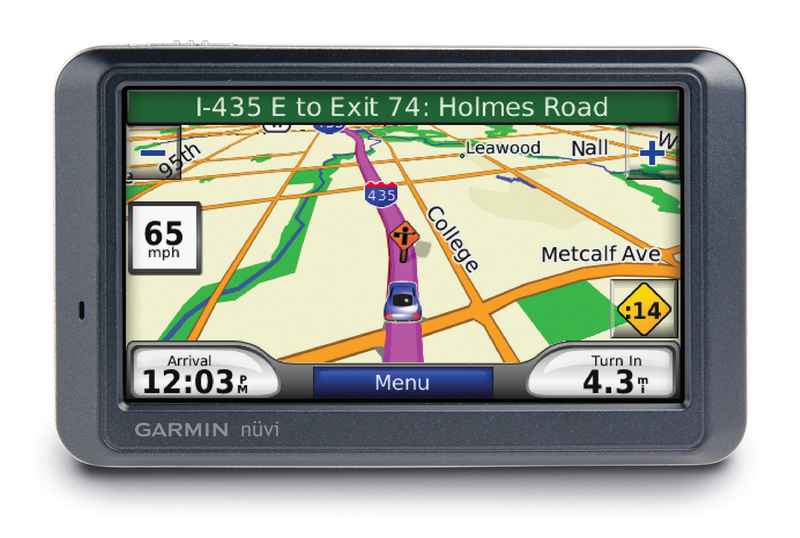 Some background: The Garmin was a navigation tool used by your kind and…hmm? Oh, you know what it is. I had a speech all prepared about the Global Positioning System. I guess I can throw these index cards out, then. Anyway, they typically did not contain the locations of secret cloning facilities. But for some damn reason, Tommy’s flickered to life and started giving him turn-by-turn directions to…somewhere. 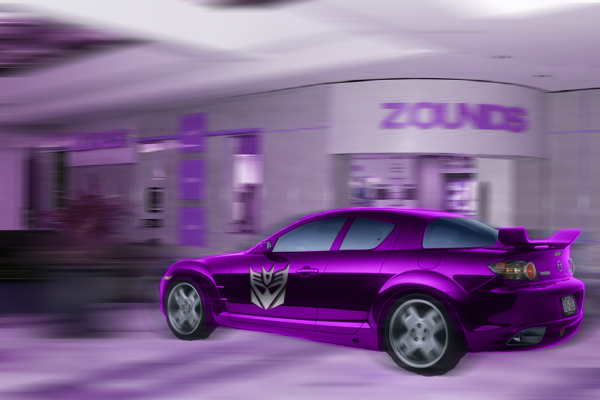 Which led Shockwave to utter a rather uncharacteristically colorful phrase. Tommy laughed at his stoic partner’s outburst. “That is very funny, Shockwave! You finally learning to swear!” The Mazda RX-8 careened around a corner and sped down a busy street, dodging and swerving and cutting off one car after another. Wiseau was a skilled driver, but madder than a March hare in April. As they crossed the last few miles to their home, the unusual pair engaged in the argument they’d been having over and over again every day for years. It wasn’t even so much an argument anymore as a ritual. I understand a good many married couples fall into this sort of pattern. It’s almost as though they’re happier fighting than not having anyone to fight with. I tried that whole marriage thing a few times before I realized I was too sane and not mortal enough to make it stick. What I miss most is the shoes. Women’s shoes are the most fascinating phenomenon I have encountered on my travels. I’m not kidding. Anyway, I’m taking a smoke break. I’ll catch up with you in a bit. Tags: clones, murder, mystery, nonsense, Shockwave, story, The Room, Tommy Wiseau, Transformers. Bookmark the permalink.